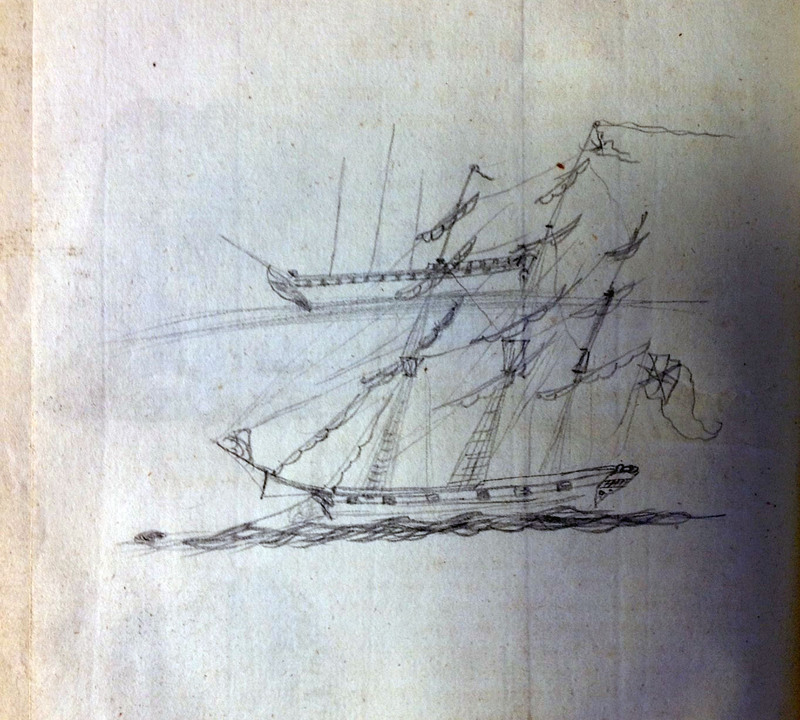 This week Emily reports on an item discovered by the Lighting the Past team from within the ‘D’ section of the Copyright Collection. You can see the previous post in the series here. 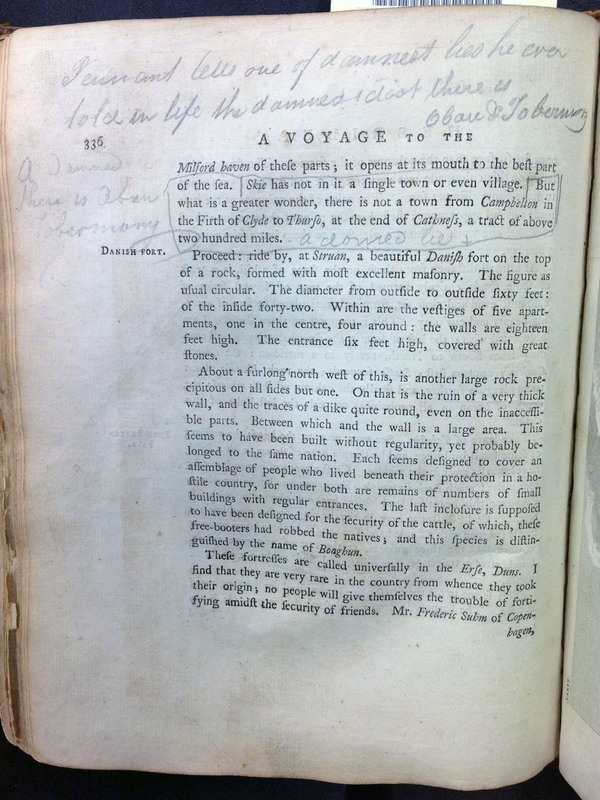 Thomas Pennant (1726 – 1798) was a Welsh naturalist and antiquarian who also travelled widely in the British Isles. 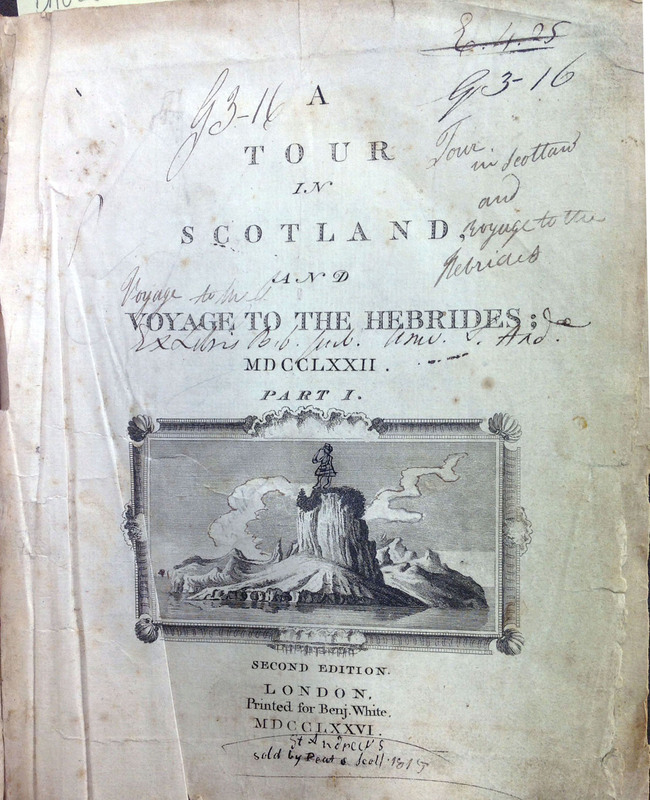 He made two tours of Scotland, first in 1769 and again in 1772, and published accounts of both journeys, which included observations on the history, geography, zoology, and culture of the places he visited. 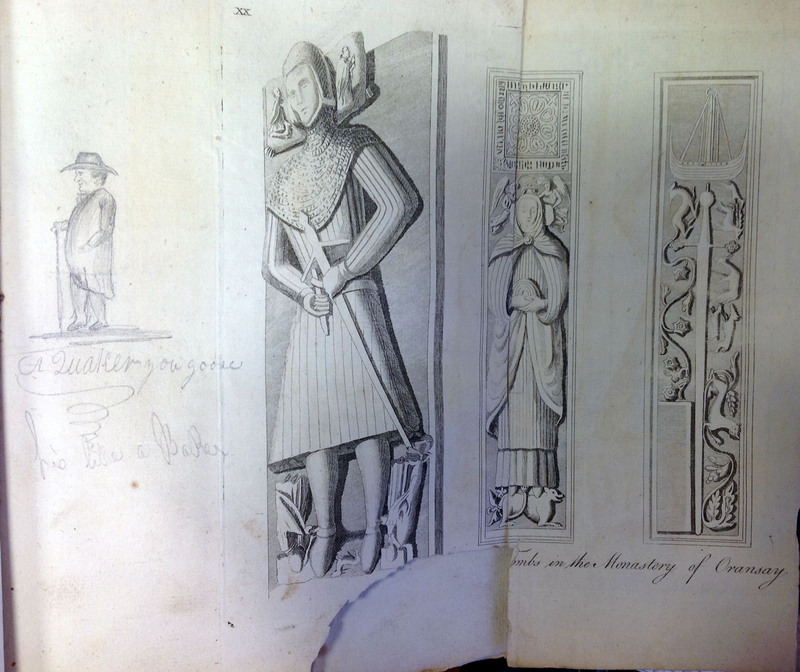 The Copyright Collection holds copies of both publications, and each of the volumes is heavily worn. 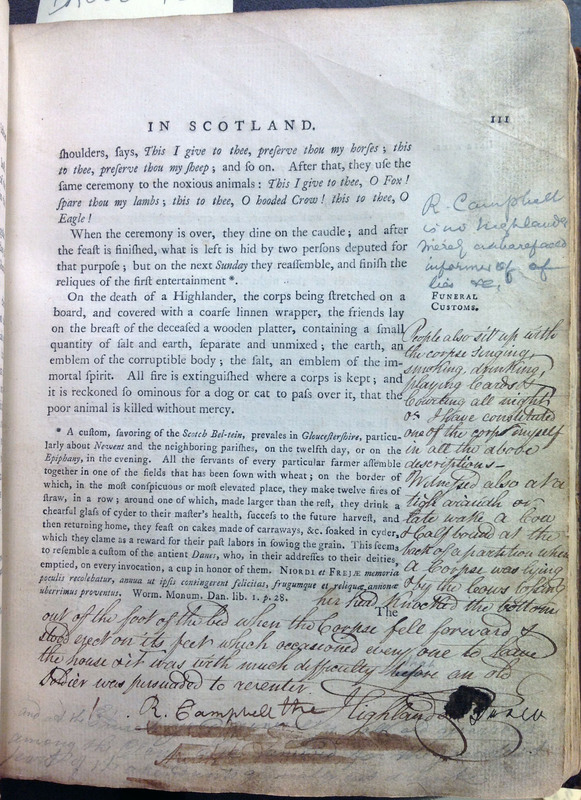 Based on the sheer number of annotations, as well as the content of those marginal notes, the late-eighteenth and early-nineteenth century students of St Andrews seem to have questioned not only Pennant’s sources, but also his authority to speak on such matters. 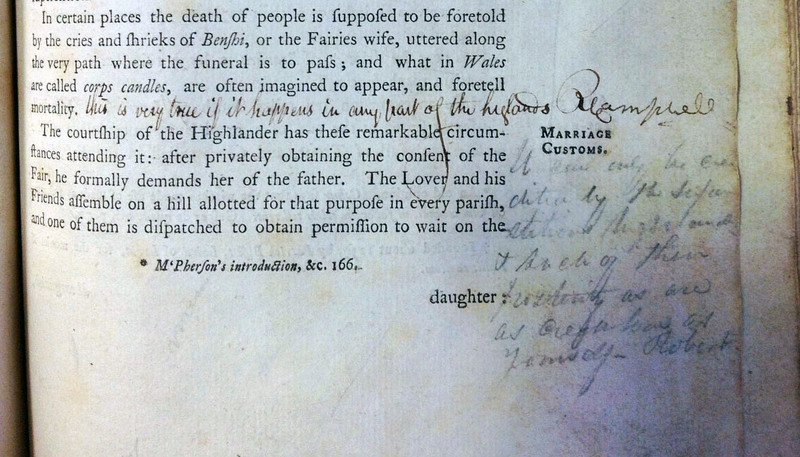 A typical marginal annotation occurs in the section discussing the author’s trip around the Hebrides. 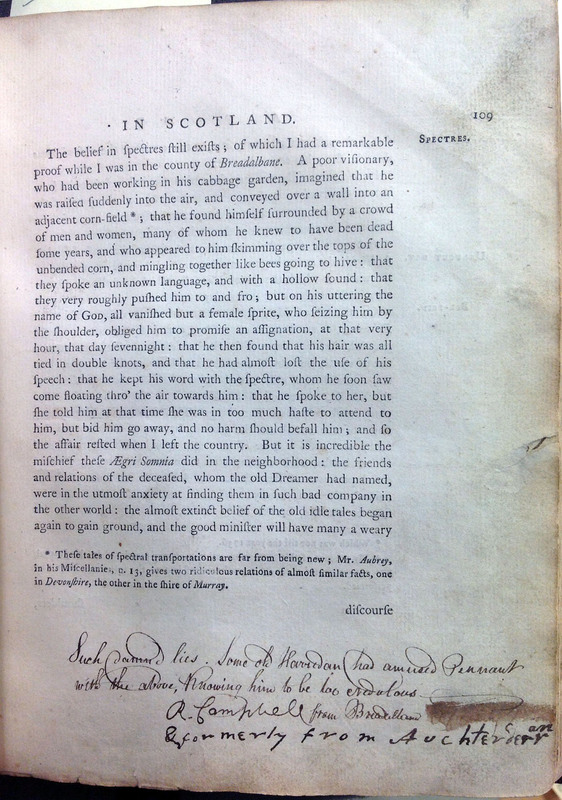 Pennant stresses the almost desolate nature of those islands, stating that while the Isle of Skye has neither towns nor villages, the “greater wonder” is that “there is not a town from Campbelton in the Firth of Clyde to Thurso…a tract of above two hundred miles.” But several readers objected to this, with one pointing out that the author has ignored both Oban and Tobermory. 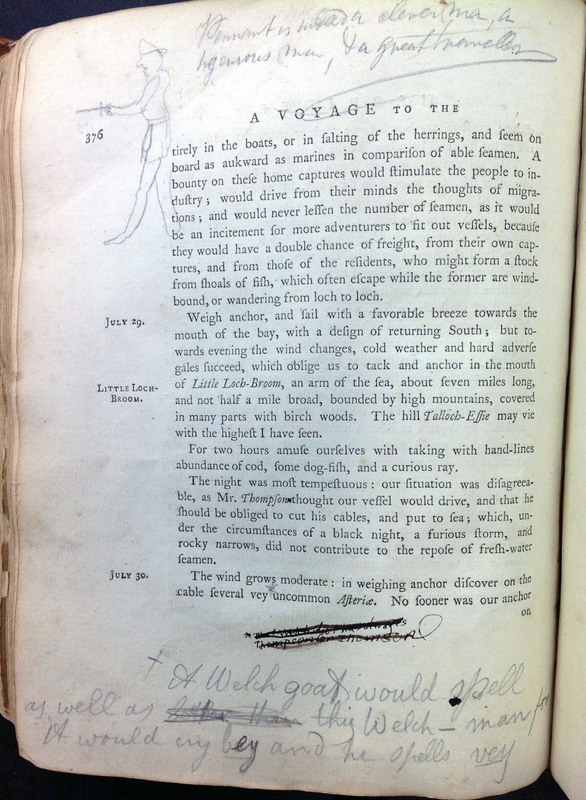 Students not only took issue with Pennant’s flawed observations, but with those added to the margins by their own peers. One such marginal dispute emerged on the topic of disease. 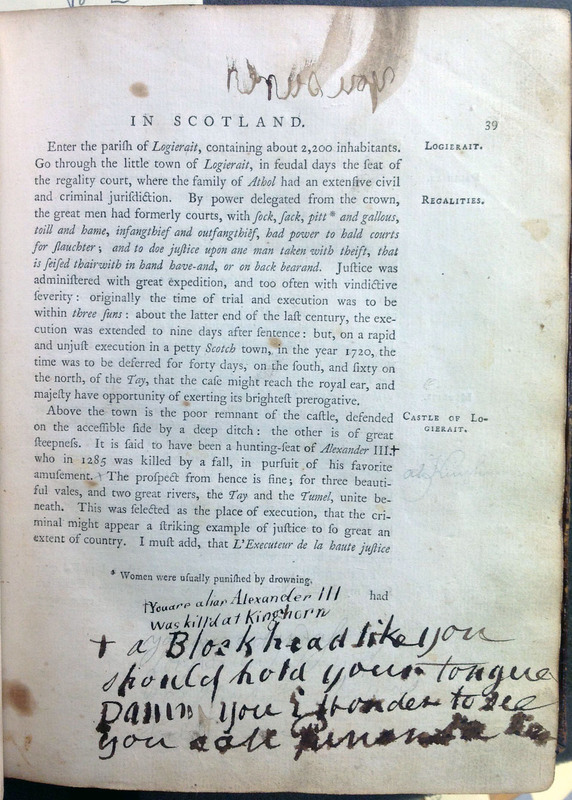 While one student suggested that “the itch is common” in the Highlands, another disagreed, arguing instead that it was widespread in the Lowlands. 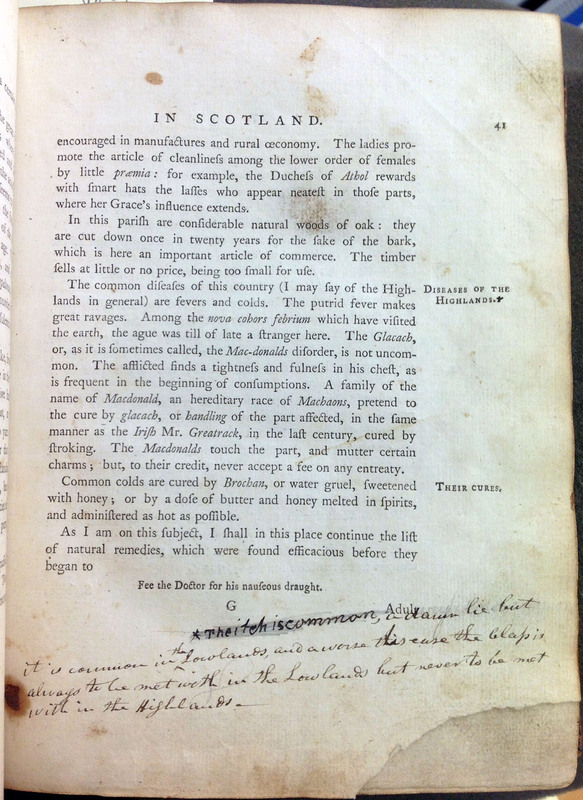 What’s worse, this second student observed, was the prevalence of the Clap in the Lowlands, something that is never found in the Highlands! What’s that about a Welsh goat? 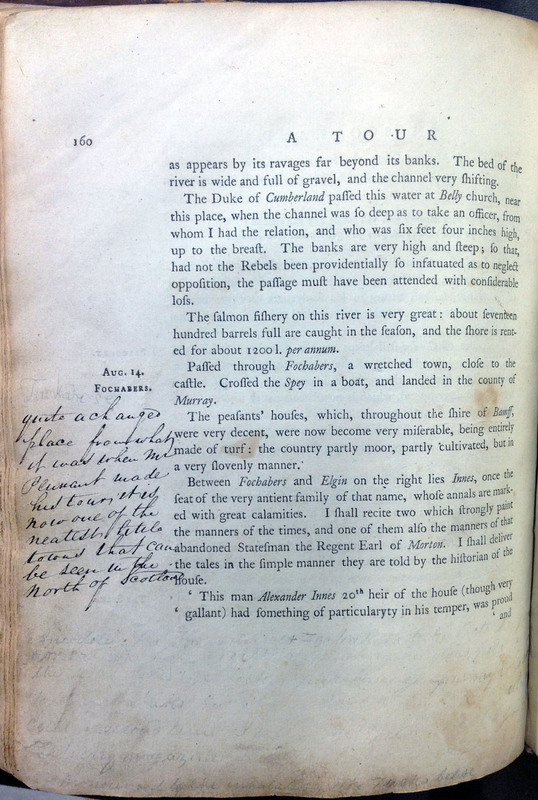 Even those students who despaired over the sorry state of their volume with its ripped pages, missing engravings, ink spills, humorous doodles, and countless scribbles, did so by writing in that very book. 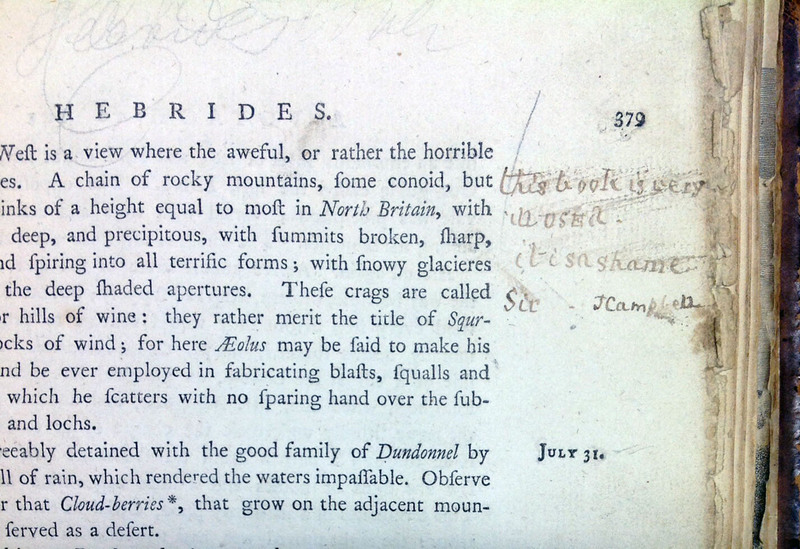 The students commenting on the lack of mention of Oban or Tobermory were wrong. Both are late foundations – surprising as both are good natural harbours. Is there a list of what the different classmarks all were, please? Hello Karen, this post was based on the one text with the classmark s DA855.P3. 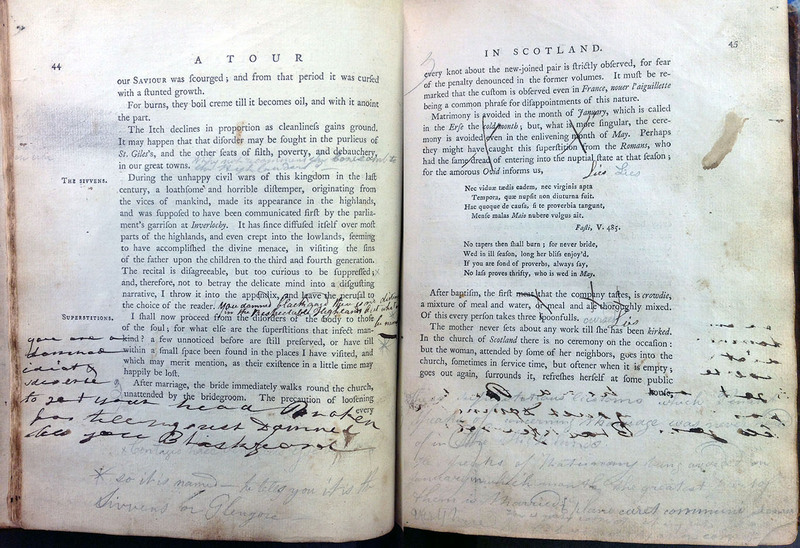 You can view the catalogue entry here: http://library.st-andrews.ac.uk/record=b2434267~S5. If you have any further questions please let us know.